Men and women have been interested in age spot remedies for centuries. Combine today's latest skin technologies with proven homemade remedies and you may see the results in minimizing the appearance of these spots. Many people prefer using natural age spot remedies. Natural remedies combine fruits, vegetables or items from your kitchen pantry to make a liquid to apply on the spots. Apple cider vinegar: Mix one-teaspoon apple cider vinegar with one-teaspoon fresh onion juice. Use a cotton ball or pad to rub the solution on the spot, and let it stand for at least 30 minutes. Rinse off the liquid and repeat the treatment daily for up to six weeks. Alternatively, mix two teaspoons of the vinegar with one teaspoon of orange juice. Dab a cotton pad into the mix and rub it on the spots. Buttermilk: Dampen the corner of a washcloth with buttermilk and then dab spots with the liquid. Buttermilk contains acids that are beneficial to the skin. Horseradish: Purchase a fresh piece of horseradish, cut off about four to five inches, and grate it into a plastic storage container. Mix the grated horseradish with one-third cup of apple cider vinegar. Store the mixture in a sealed container and shake it once daily for two weeks. Strain off the liquid, and rub some on the age spots two to three times a day. Store the remaining liquid in a sealed container in the refrigerator. Lemon juice: Dip a soft cotton swab in a capful of lemon juice and rub over age spots twice a day. After about a month, you should see a difference in the color of the spots because the citric acid in the lemon juice burns away the spots over time. Avoid sun exposure until the juice dries completely to prevent burning the skin. Holistic practitioners use an approach that comprises total body wellness. The holistic method of fading age spots includes making permanent lifestyle changes that may result in reducing the appearance and darkness of the spots. In addition to making changes in your eating habits, exercising daily, utilizing procedures such as liver cleansing, avoiding sun exposure, or using appropriate supplements can slow down the aging process. Diet modification: Some women have success in fading spots by making dietary changes. Changes in the diet help the body release toxins and diminish the chances for skin discoloration. A skin-strengthening diet consists of lots of fruits, vegetables and pure water. A purifying diet contains no caffeine, alcohol or oily foods. Supplements: Supplements in tablet, gel or capsule form taken daily may give you some relief from these blemishes. Supplements like vitamin C, potassium, zinc and vitamin E offer health benefits such as aiding in tissue repair. If you are already taking prescription medications, consult your doctor first before taking any supplements. Skin science has discovered new products and ingredients to fight the signs of aging. 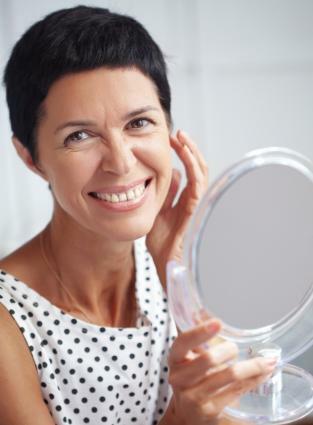 Look for over the counter (OTC) anti-aging skin care products that contain active ingredients like alpha hydroxyl acid, which works under the skin's surface to encourage cells to reproduce or retinoids. Aloe vera: Buy aloe vera gel or use the gummy liquid from a fresh leaf to treat your spots. Leave the aloe vera on your skin for about an hour and apply it twice daily for a month. Chemical peels: A specialized solution is used to dissolve age spots and other damaged surface tissue. There are various types of peels, and the intensity of the treatment depends on the skin type, degree of damage, and application method. Generally, patients may experience a stinging or itching sensation during chemical peel treatments along with some irritation or redness during the healing period. Microdermabrasion: A special tool or exfoliant scrubs away the dark spots, exfoliates the skin deeply, and reveals fresher, healthier and smoother skin. In addition to improving the skin's texture, microdermabrasion diminishes the appearance of pigmentation such as age and sunspots. Side effects are minimal depending on the individual's general sensitivity and could include some redness immediately after the treatment. Purchase a kit or visit a skin care specialist or dermatologist for this procedure. Typically, an at-home microdermabrasion treatment is one of the cheapest methods for fading spots. Prescriptions: Your physician may give you a prescription for a bleaching cream to fade spots gradually. For best results, practice safe sun protection during and after using the bleaching cream. Retinoids: These synthetic substitutes for vitamin A encourage new cell growth and provide natural exfoliation. Purchase them in skin cream formulations for day or night use. Considered the gold standard when it comes to age spot removal methods, a dermatologist or plastic surgeon can use laser treatments to fade the spots away. However, these treatments, which involve burning the spots off with a laser, are expensive. While pain levels are usually minimal and the treatments are generally short, some women report that the method is slightly painful. Freezing off spots and warts, also referred to as cryotherapy, has garnered a lot of attention in recent years. Often used to eradicate cancerous skin cells, it can also remove age spots. The technique involves freezing abnormal cells with liquid nitrogen, which is placed on the spot to destroy the dark pigmentation. The procedure is typically quite quick with minimal side effects such as the formation of blisters, scarring and bleeding. This procedure, also known as IPL, is a more recent player in the world of age spot removal. It involves a stream of intense broadband light that burns age spots quickly and efficiently. Generally, the treatment is free of side effects and does not require a long recovery period. Since sun damage is such a major factor in the development of age spots, it should come as no surprise that preventing their formation starts with sun protection. Proper sun protection is essential for everyone who spends time outdoors, no matter what time of year it is. Wear sunscreen with a sun protection factor (SPF) of at least 15, and be sure to apply it at least 15 minutes prior to stepping outdoors. The key to spot free skin is to prevent further outbreaks once your skin is clear. Wear long sleeves and a wide brimmed hat when you head outdoors. Age spots are a part of getting older. Many women ignore minor spots, but if they are large, obvious, or make you uncomfortable, treating them can help you have the confidence that comes from looking and feeling your best. With the right remedies, you can fade age spots and enjoy clear skin again.